When discussing the French translations of the Tibetan astrological pebble symbols recently, an interesting question was asked : what sort of "pebble" do these symbols represent ? Well, the Tibetan word rdel རྡེལ, although customarily translated into English as "pebble", is a general word for any small, hard, roundish object, including both natural stones and human artifacts. My theory is that the black and white pebbles used in divination are the same as the small, round black and white pieces used to play the classic board game of Go (go 碁 in Japanese or wéi qí 圍棋 in Chinese). For anyone not familiar with Go, it is a board game of enormous popularity in China, Korea and Japan that is played by placing black and white "stones" (rdel in Tibetan) on a 19 x 19 grid of 361 points in order to encompass territory. The rules of Go are simple, but due to the large grid size on which it is played, the possibilities for different positions are almost endless, and so it has a far greater degree of complexity than chess. Along with painting, calligraphy and playing the zither (Chinese qín 琴), mastery of the game of Go was traditionally considered to be one of the four accomplishments of a Chinese lady or gentleman. The game of Go is also played in Tibet, where it is known as mig mangs མིག་མངས (pronounced ming mang or mi mang), meaning "many eyes". 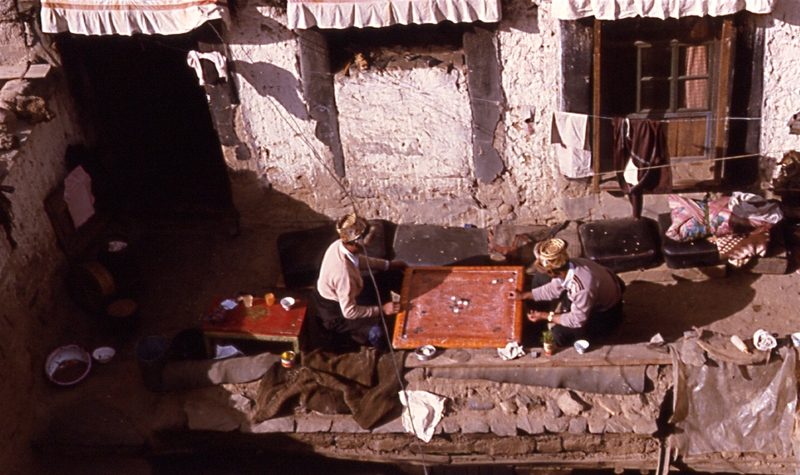 The game is not as widely played in Tibet as it is elsewhere in East Asia, being traditionally restricted to aristocratic families and some communities of monks. The Tibetan form of Go has a number of idiosyncratic rules, but the most significant difference from the game played elsewhere is that the game is played on a board with a 17 x 17 grid of 289 points. In addition to the standard form of the game, a uniquely Tibetan game in which black and white stones are lined up along adjacent edges of the board, and the stones moved in straight lines in order to pincer the opponent's stones is also played (somewhat like Othello or Reversi). If you want to know more about Tibetan Go, then read The Game of Go in Ancient and Modern Tibet by Peter Shotwell. Yesterday I was looking through some photos that I took in Lhasa more than twenty years ago (!! ), and which had been hidden away unseen for almost as many years, when I came across this one (which I have no recollection of taking). At first glance it looked like it was a picture of a game of Tibetan Go, but on closer examination I was disappointed to see that it could not be (no grid lines, very large black and white pieces, and pieces not laid out as they would be in a game of Go). It was still an interesting picture, and would have been a good one but for the wire, so Ithought I would post it here anyway. I think it must be a game akin to Shove Ha'penny, where the players take turns to knock the other player's peices into the holes at the four corners of the board, but I would love to hear from anyone who can identify the game, and tell me whether this is a traditional Tibetan game or not. Peter Shotwell notes that the not-go game mentioned might be called "bKugom bu Chos" - any idea what this means? 'bu' and 'chos' seem to be legitimate Tibetan words, but 'bkugom' only turns up references to the same phrase.